The Days Ahead: Big earnings week. First look at Q1 GDP. One Minute Summary: A quieter week on the economic front but what there was uninspiring. Housing starts were fine but most of the increase was in multi-family housing. Industrial production was up but flattered by energy and mining, which are 20% of the index. We saw new nominees for the four (!) open positions at the Fed. We like them so no drama there. The S&P 500 was up for the week. Small company stocks, Emerging Markets and International all had a better week and all three are ahead of the S&P 500 year to date. The best market was the U.K. It’s by no means out of the Brexit problems but the stock market has a heavy 22% weighting to mining and commodities, which have been on a roll recently. Earnings were positive. But the market has distinguished between “bad, good earnings” which would be better net income mostly due to lower taxes and “good, good earnings” which would be better because of margins or volume. In the first camp put Philip Morris and IBM (down 17% and 8%) and in the latter, Netflix and industrial supplier Grainger (both up around 6%). Generally, earnings are having a barn- storming quarter with companies showing 18% annual growth. The 10-Year Treasury rate rose to 2.95% but some of that is because of a heavy refunding week coming up. We don't expect it to continue to rise. 1. How’s that curve flattening going? : We know, pretty much, that the Fed will raise rates another two or three times this year. But this is not the risk in the market. The main concerns are will the Fed Funds rate exceed the 2-Year Treasury and how will the market react? 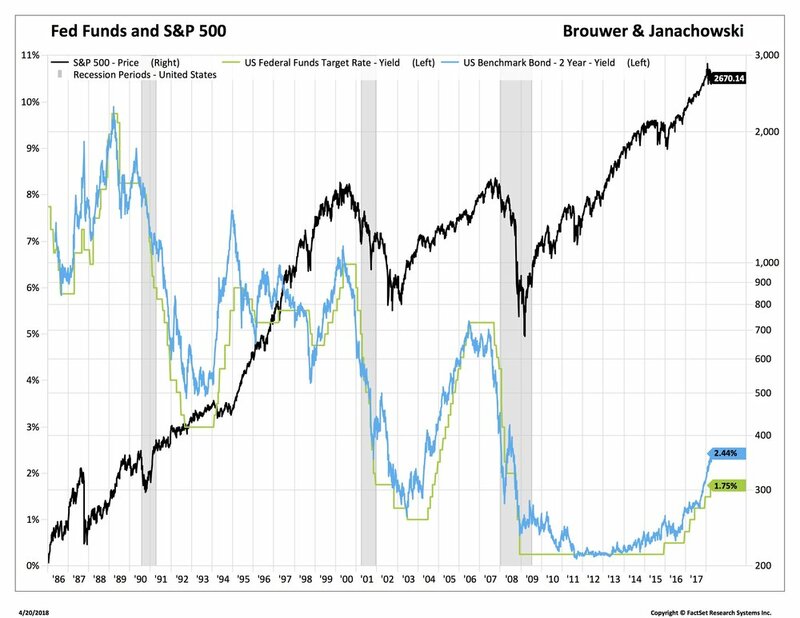 Here's a chart showing the Fed Funds policy rate and the S&P 500. If the Fed Funds rate catches up with the 2-Year Treasury, stocks will begin to correct or at least tread sideways. he Fed has for the last 30 years, had a “put” in place. It started with Greenspan and continued right through 2016. Basically, if the market stalled, the Fed cut rates. We think the Fed “put” is unlikely to happen this time. As one of our favorite commentators put it, “The Fed will accept a recession before it allows high inflation.” What we’re seeing now is the gradual flattening of the yield curve and that means the economy is slow and money is tight. The Fed seems ready to pounce if we get a few reports of accelerating inflation. They're unlikely to be concerned if the market swoons. Providing, of course, the Fed can keep its independence. What does it all mean? Slower growth and range-bound rates…and probably stocks. What stocks do you think are going up? We're interested in the blue bar, which is the S&P 600 and you can see it outperforms the Russell 2000 in 17 of the 23 years since 1994. It gets even better because its margin of outperformance on the downside is larger than its upside performance so the volatility, risk and things like Sharpe ratios are also superior. 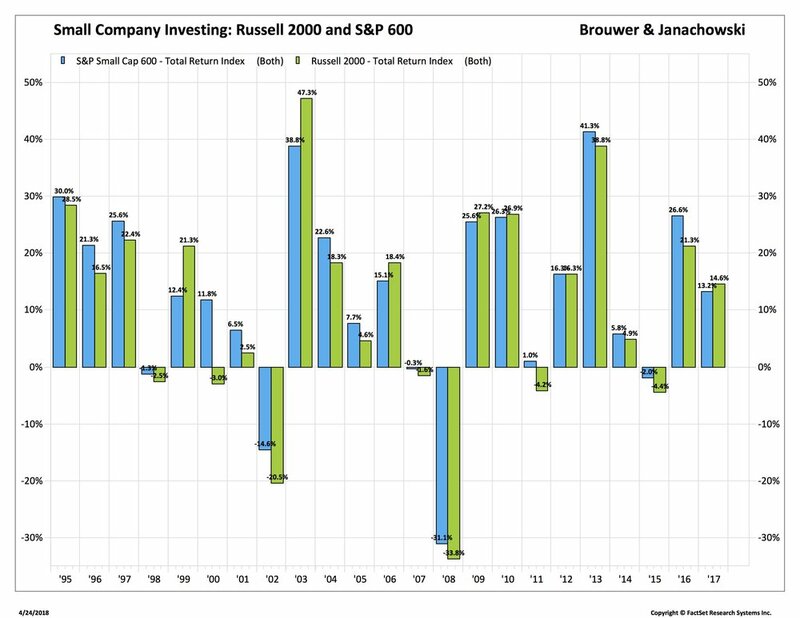 So how much more did one earn using the S&P 600 versus the Russell 2000? Well, a $10,000 investment made in 1994 would be worth $131,000 in the S&P 600 and $86,000 in the Russell 2000. Now S&P knows their index is better so they charge for it. But that cost is absorbed by the ETF provider and doesn't show up in the expenses paid by the shareholder. Basically, the S&P 600 has a quality bias and because it rebalances more frequently it’s less prone to front running. This happens because an active manager can identify what companies are likely to fall out or be included in the Russell 2000 and start to trade it ahead of the July 1st date knowing that, on that date, some $750bn of funds will be forced buyers and sellers. In fact the rebalance effect alone accounts for 0.6% of the 1.9% annual outperformance. So if the S&P 600 is so much better, why is it still around? Well, two reasons. First, there is a place for an index that just takes all the listed companies and basically says “this is what’s available, use it if you want.” Second, it's an easy index to beat so active managers tend to like it. The lesson? Indexing is great but always ask how the index works. There are many ways to construct an index and, as you’d expect, some are distinctly better than others. Bottom Line: There is profit taking going on as well as some sector rotation. Energy is a favorite sector right now. At the risk of sounding like a broken record (what’s the digital equivalent? ), the tweets and politics could unsettle the market very quickly.